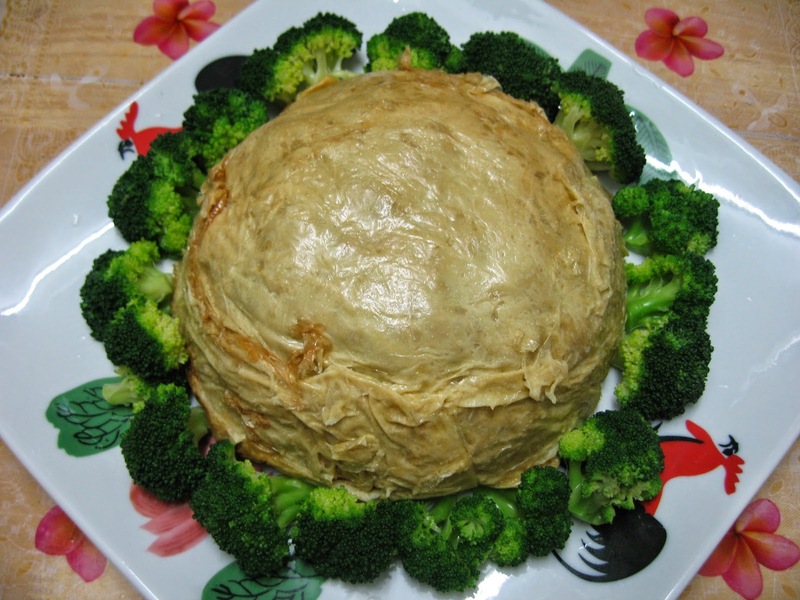 Gong-Xi, Gong-Xi, A perfect vegetarian dish for the Chinese New Year! 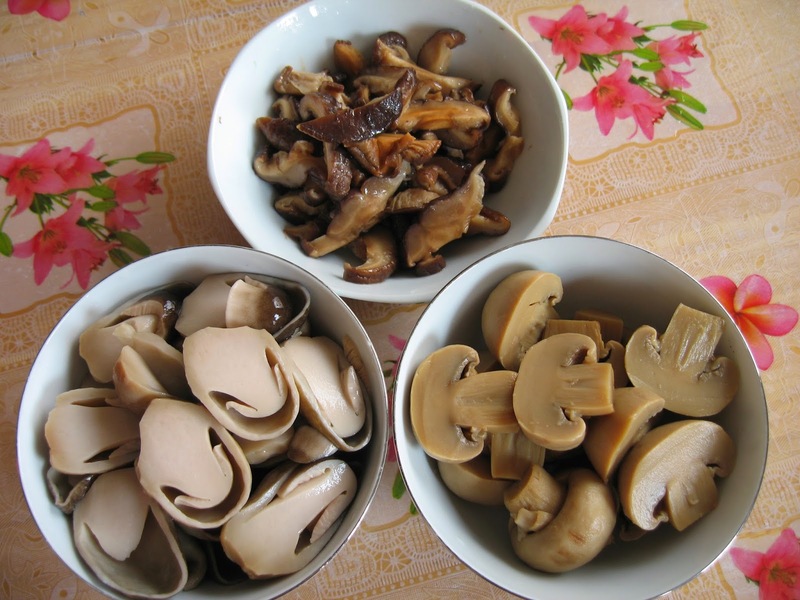 It consists of five varieties of mushrooms and beancurd sheets, all of which are my family's favourite food items. The ingredients used were very basic and easily available. The resulting flavour was simply awesome! The whole ensemble looks so wondrously beautiful. It looked like a treasure chest encased by jade pieces ! I find the entire presentation so lovely and pleasing to the eyes and will definitely look grand and auspicious on any dining table! This vegetarian dish is just sumptuous! 2. Bring water to the boil. Pour in the broccoli florets and let boil for 2 to 3 minutes. 3. Add in salt, sugar and oil. Drain and leave aside. 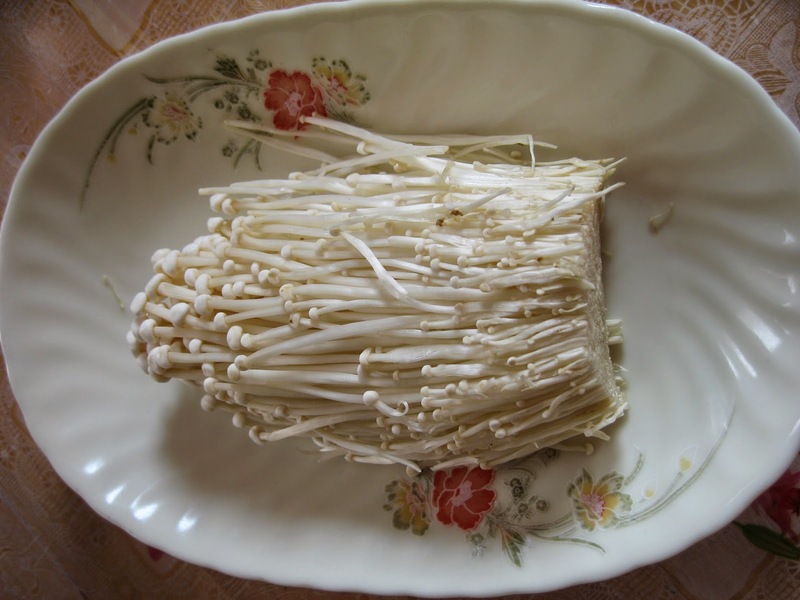 Bottom left : Canned straw mushrooms. 1. Spread out the foo pei ( beancurd ) sheets and fold over into half. Hold foo pei by both hands and carefully lower the centre portion into hot oil and deep fry until it has bubbles all over. Next, change direction for both ends so it gets even out. Remove from hot oil, rinse and wipe dry before spreading it over a big bowl. Alternatively, use a pair of bamboo chopsticks or tongs to deep-fry the beancurd sheets. 2. Heat wok with a drizzle of oil. Saute garlic. Add in all the 5 types of mushrooms. 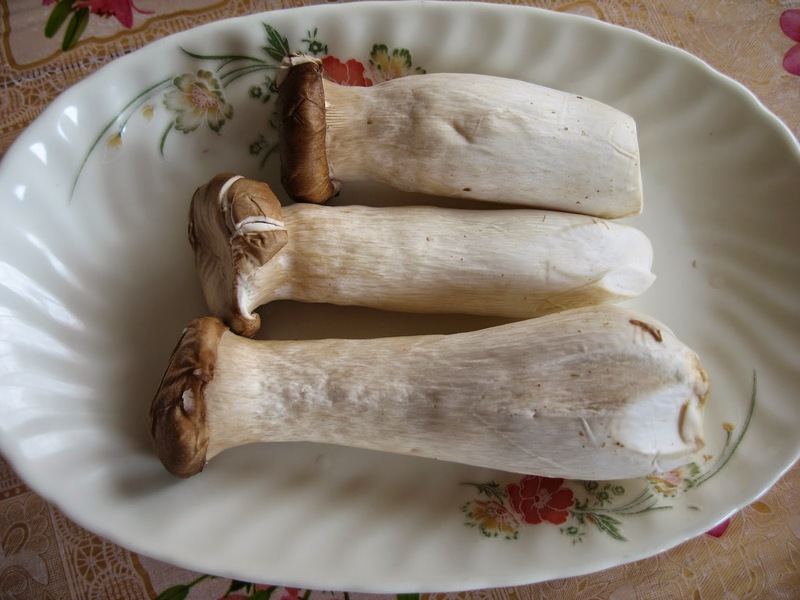 Mix well and lower heat to braise a while so that water will seep out from the mushrooms. Add seasonings. 3. 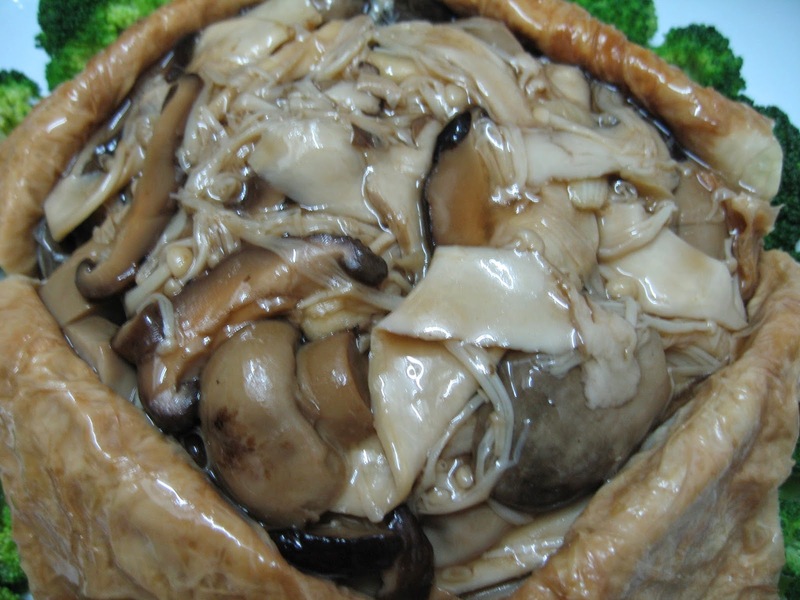 Scoop out the braised mushrooms into the big bowl which has been lined with the deep-fried foo pei or beancurd sheets. 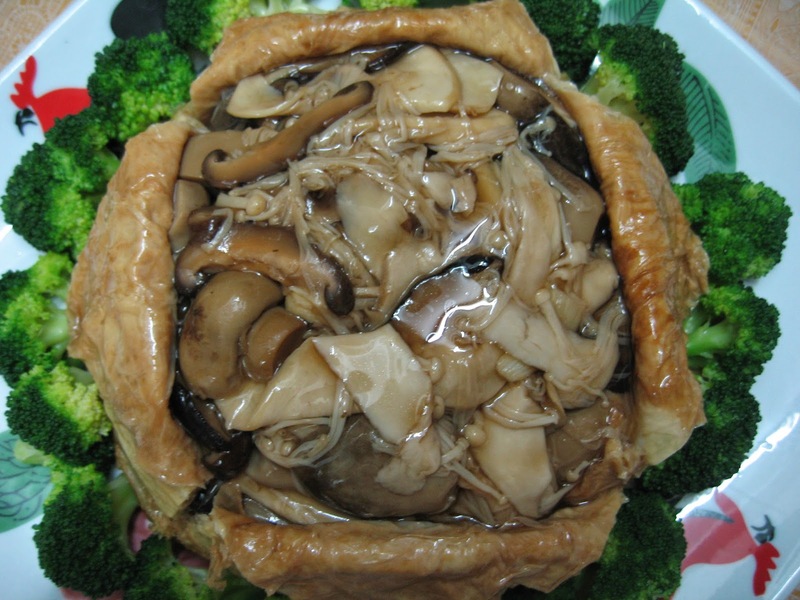 Fold up the edges to cover the mushrooms. Steam for 10 minutes. Remove and invert over a plate. 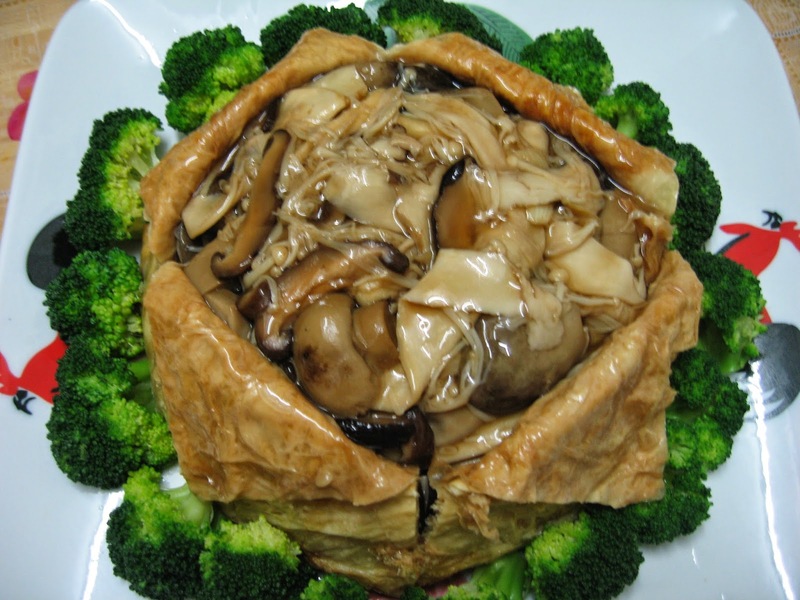 Cut across the foo pei and pull apart the flaps to show the braised mushrooms. 4. Heat water for ingredients C, add in oyster sauce and chicken stock granules and mix well. Add in beaten eggs in a drizzle to make egg strands. Or alternatively, use cornflour mixture to thicken the sauce. Pour this sauce over the braised mushrooms. 5. Garnish with boiled broccoli all round the inverted braised mushrooms. Make a cut cross the inverted bowl of foo pei. Oh Wow! This is truly awesome! This is no doubt a super delicious dish. 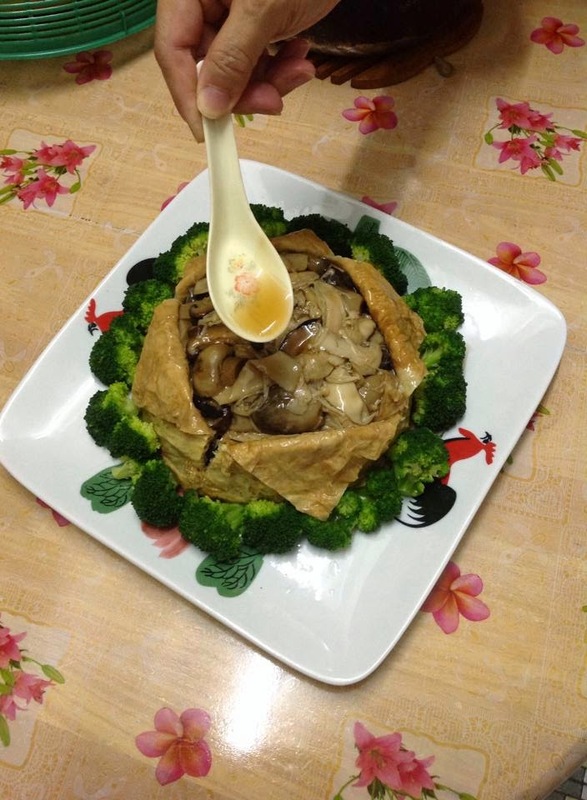 I was looking for a vegetarian dish besides loh hon chai to cook for CNY and boy, was i happy to see your beautiful dish. Thank you for sharing, Doris. I like your presentation of this dish. Very grand like restaurant style. So many types of mushrooms... I will love this for sure! Hi Doris. I tried to cook up this dish last weekend. The only problem I had was after deep-frying the foo pei, it became crispy and broke into tiny pieces. Thus I could not wrap the mushrooms. Do you I had bought the wrong type of foo pei? The dish was otherwise very delicious. Thank you. Hi, Basically foo pei are of two types. 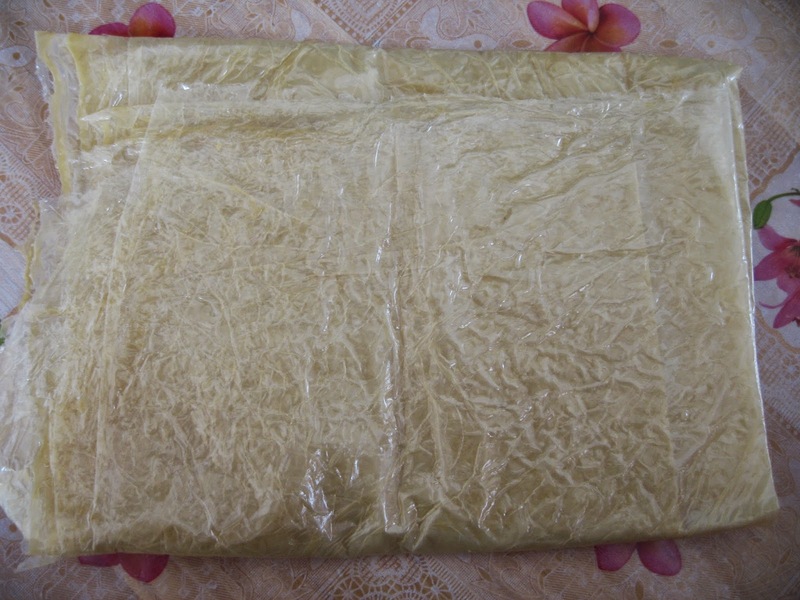 One is for wrapping which is tougher and the other is for adding into tong sooi which softens easily. Next time ask for the type for making yong tau foo.May you be successful in your next attempt. Hello.. this looks incredible! I'm looking forward to making it. I was wondering, could this be done without deep frying the bean curd sheet? 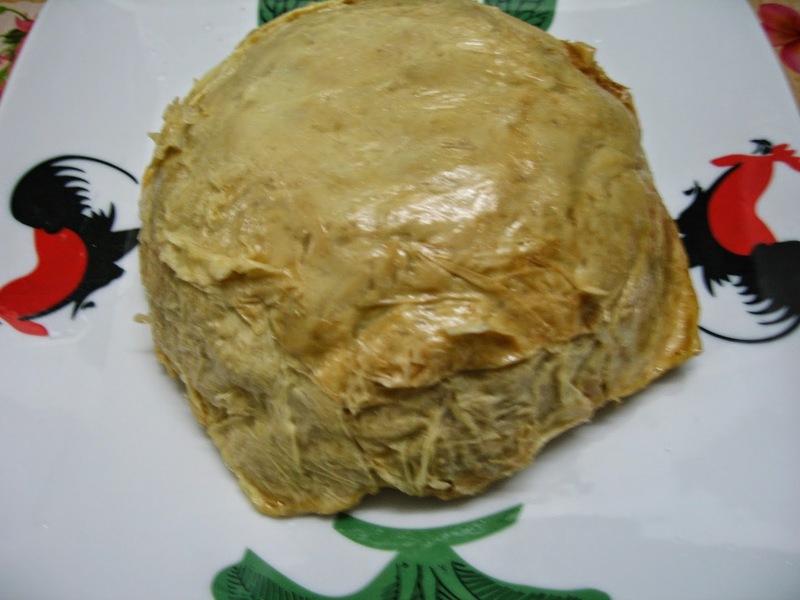 The beancurd skin will break if it is not deep-fried.